NEW LISTING!! All Dates Open- Don't Miss Out! Majestic Beach Resort is a place where time stands still, as emerald waters melt into dazzling white sand beaches. With over 650 feet of beachfront on the Gulf of Mexico, singles, couples and families of all ages will find Panama City Beach the perfect destination. Majestic Beach is a place where your family can make lifelong memories. With all the amenities, everyone will love their Majestic Beach vacation. But that’s only the beginning. Our location gives you easy access to Pier Park, the newest tropical life-style shopping mall with over 1 million square feet of shopping, stores like Old Navy, Dillard’s, Ron Jon Surf shop and more, a 16 screen movieplex, well known restaurants like Longhorn, Outback and Johnny Rocket and local favorites like Jimmy Buffet’s Margaritaville. And you’ll even find Starbucks so you can get your latte fix. On Friday nights the amphitheatre features free live concerts that the whole family can enjoy. 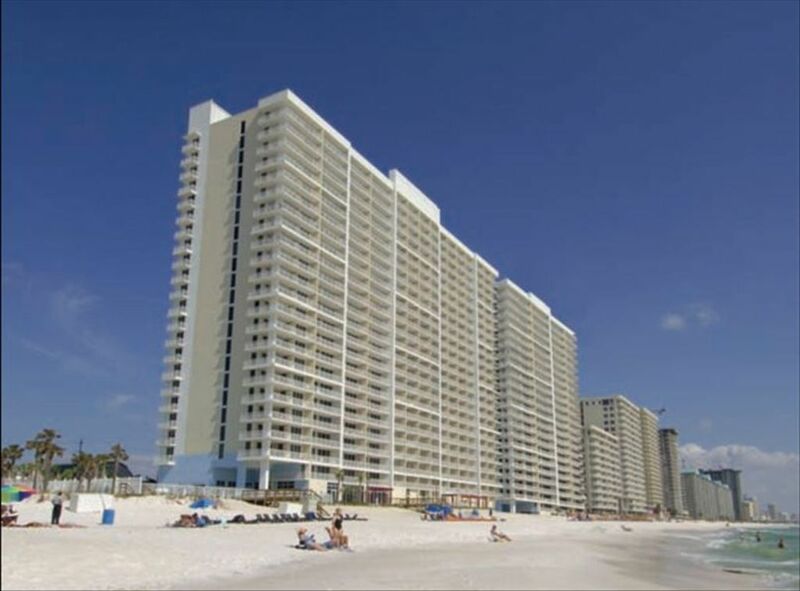 This beachfront condo is in the luxurious Majestic Beach Towers. Step out onto the patio and see the beautiful blue waters, and breathe the beautiful air. Take a swim in the indoor heated pool, or relax in the hot tubs. Located on the fifteenth floor, and just a few steps away from the elevator, you'll enjoy all the conveniences you desire. The breezeway to the parking garage and movie theatre is just a few feet from the elevator. No more lengthy walks to and from the beach. Getting on the beach has never been quicker. You're literally 15 steps to the elevator, and 50 steps to the sand. It's that close to the beach. Designed with comfort and style in mind. The LIVING ROOM features a comfortable sofa that opens into a queen sleeper. Elegant glass dining table and bar-stools that line the bar area. The entertainment armoire contains an oversize television that is equipped with a cable television package that allows you to access a dozens of channels, and a DVD and that allows you to play your favorite movies. If you want to truly enjoy the beach experience wonder out to the balcony through your floor to ceiling sliding doors enjoy the sugar white sand beaches and emerald green Gulf waters. The MASTER BEDROOM features a luxurious European KING sized bed and private tiled bath. You’ll also enjoy the Jacuzzi shower and garden tub where you can relax and reenergize after a day full of beach activities. A flat-screen TV equipped with cable. You will think you have walked into someone's warm and stylish home, not a condo on the beach. The open gourmet KITCHEN area looks out over the water and features beautiful Corian counter tops with attractive cabinets and appliances. It’s fully stocked so no matter whether you’re cooking your specialty or just fixing grill cheese sandwiches you’ve got everything you need to please the family. Wraparound bar makes it easy for everyone to grab a quick snack or a full meal. The DINING AREA comfortable comfortably seats six, and offers beach views so the family can share meals and trade their favorite part of their days at the beach while enjoying all the beauty of the gulf. There is a Washer/Dryer located in the unit and it will make keeping everyone in clean clothes a breeze. The master bedroom along with the pull-out sleeper sofa in the living room allow the unit to sleep 4 comfortably including 1 Bath. This Majestic Beach resort residence is just the place for you and your family to enjoy a truly memorable beach vacation. It’s available now, but it won’t be later. So look for the link to make your reservations today. Add 12.615 % Florida Tax, and $85 Housekeeping Fee to Rate. On-site fitness club; spa; movie theatre; tennis courts; Conference Center; Poolside Bar and Grill; Seaside Market & Deli, including Starbucks.